CarGurus has 5,960 nationwide Cayenne listings starting at $3,500. Porsche has given its posh and performance-driven Cayenne a hefty refresh for the 2015 model year. The most noteworthy changes are mechanical and thereby lead to a more streamlined trim lineup, but a few interior and exterior cosmetic tweaks are also slated, including a reworked rear end that features twin tailpipes integrated into the rear bumper cover. New bi-xenon headlights, LED taillights, front “airblade” fins and a redesigned multifunction sport steering wheel are also debuting in the upcoming model year, as is, alas, a higher price tag. The bean counters at Porsche obviously feel the introduction of the downsized Macan into the 2015 crossover market allows a larger premium for the quasi-new-look Cayenne. Expect this high-end crossover to come in 4 trims in 2015, with the Cayenne Diesel now the base version, followed by the up-powered S and the brand-new S E-Hybrid plug-in, while the potent and admirably equipped Cayenne Turbo returns as the flagship of this formidable fleet. Again for the looming model year, all Cayenne trims will be delivered with standard intelligent all-wheel drive (AWD), which gives this plush and versatile mini-ute some surprisingly competent off-road capability with the standard Porsche Traction Management (PTM) feature complemented by the available Sport Chrono Plus Package with driver-selectable Sport+ mode. Getting down to the nitty-gritty, the now-entry-level Cayenne Diesel again boasts a 3.0-liter turbodiesel V6 engine that mates with the standard 8-speed shiftable automatic transmission (Tiptronic S) to put out 240 hp and 406 lb-ft of torque. Look for the return of an estimated 19 mpg city/29 highway from this engine, which remains the most fuel-efficient engine in the lineup. Moving up to the Cayenne S, expect a brand new 3.6-liter twin-turbo V6 gasoline-burning powerplant to replace the less fuel-friendly 4.8-liter blown V8. This debuting turbocharged V6, again managed by an 8-speed shiftable automatic, pounds down 420 hp, but torque numbers, not to mention mileage figures, have yet to be announced. The new S E-Hybrid is touted to carry a supercharged 3.6-liter V6, complemented by a newly upgraded electric motor that can be recharged either via the engine or by plugging into an industrial socket. Combined gas-electric output runs to 416 hp and 435 lb-ft of torque, and the hybrid system is once again under the management of the 8-speed Tiptronic S shifter. Porsche claims a 151-mph top speed out of S E-Hybrid using the gas engine, while range in driver-selectable all-electric mode is estimated at 18-30 miles at a top speed of 78 mph. The standard 3.6-kilowatt on-board charger, meantime, can fully recharge the 10.8-kilowatt-per-hour (kWh) lithium-ion battery in 2.7 hours, while an available 7.2kWh on-board charger will juice said battery pack up in 1.3 hours. Depending on the trim chosen, the latest Cayenne iterations sport, in addition to 2015’s noted upgrades, 17- or 18-inch alloy wheels, heated power-adjustable mirrors and a power liftgate outside, with leather upholstery, power-adjustable front seats, full power accessories, cruise control and telescoping tilt-wheel steering. Further niceties lineup-wide include a remote garage door opener, a cooled storage bin and Bluetooth-integrated Porsche Communications Management (PCM) with voice-activated navigation and a 100-watt audio system with single-CD player, 10 speakers, a 7-inch display and, of course, an auxiliary audio input. As you go higher up the Cayenne trim list, look for a standard power sunroof, front and rear parking sensors, memory for driver's settings, heated sport front seats, a heated steering wheel, satellite radio and Park Assist with a rear-view camera. Again for 2015, all Cayenne variations can be delivered with optional upgraded and upsized wheels, 4-zone auto climate control, lane-keeping assistance with lane-departure warnings, and premium leather upholstery. Porsche Dynamic Chassis Control (an adaptable suspension system), ceramic brakes and Porsche Torque Vectoring Plus also remain available to all trims, as do the above-mentioned Sport Chrono Plus Package and a plethora of interior and exterior accent upgrades and configurations. Standard safety features in the 2015 Cayenne include antilock brakes (ABS); front and, in the Turbo, rear side-mounted airbags; head airbags all around and the Porsche Stability Management System to monitor the traction- and stability-control functions. High-intensity-discharge (HID) adaptive headlights, with new-for-2015 LED headlights in the top-shelf Turbo, also return, as do front fog/driving lights, daytime running lights and a remote antitheft alarm. Adaptive cruise control with forward-collision warning is again optional for all Cayenne trims. 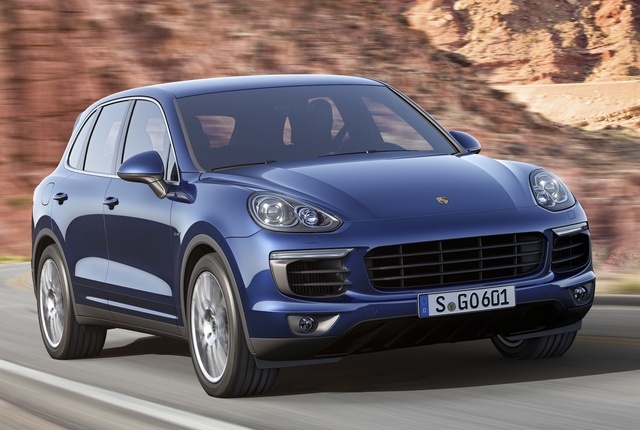 What's your take on the 2015 Porsche Cayenne? 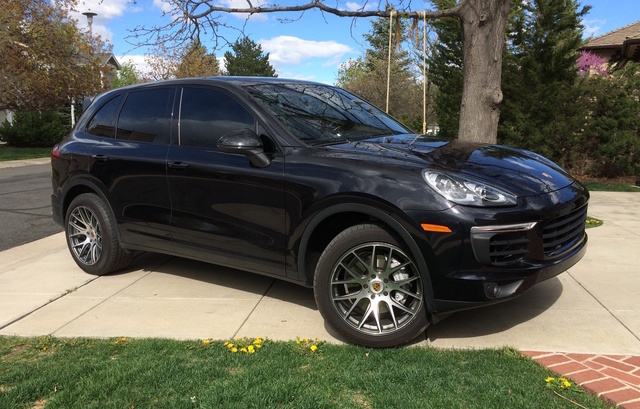 Have you driven a 2015 Porsche Cayenne?